Stage two is under way - we're grading the runs to improve drainage. There shouldn't be much disruption. We're working on a couple of stalls at a time and it takes a couple of hours. If you find your horse closed inside please make sure we don't have the gate on the run open before opening the barn door. As seen in the photo we're opening up the drainage ditch at the ends of the runs and sloping them about a foot away from the stalls. The big piles you see on the north end of the barn are about a hundred tons of structural fill which is a mix of sand and pea gravel. After grading the slope 3" of fill is added for optimal drainage. We've finished with the post and rail repairs and you can see the dramatic difference it made in the before and after photos below. They're all straight and sturdy now. 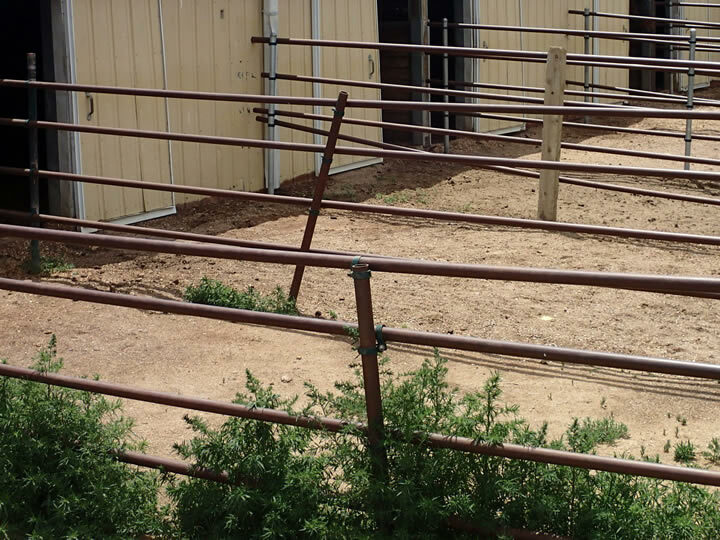 There are a few finishing touches (leveling a few more rails, capping some of the end posts, trimming some posts to height, and leveling some gates) that we're still working on, but they are basically cosmetic and shouldn't be any more horse shuffling required. Repairing and rebuilding the runs has opened up a few more spaces in the barn since several of the runs were basically unusable previously. If you know anyone who'd like to board please let them know they'd be a welcome addition to the community. The first week of August we rebuilt the ten with new cement, posts, anchors to the barn and welded top rails. We dug out the weeds, graded and recut the drainage. Juan has also been working on the inside leveling the ground under the mats. There wasn't much disruption because the runs we were working on were mostly not being used, but we've had several new arrivals in the past few days and the barn is filling up. We will be working on rebuilding another six or eight runs (south end of the west side and north end of the east side) this week. Since there are more horses now we'll have to leave some in their stalls while we work on their runs. Please look outside before letting your horse out of its stall since there may be no enclosure! The Paddocks and Pasture are next in line for some much needed upkeep and we'll be posting an update on how and when we'll be shuffling horses to accomplish it.